“Waiting too long to begin moving toward the neutral rate could risk a nasty surprise down the road – either too much inflation, financial instability or both,” Fed Chair Janet Yellen warned her rapt listeners at the Commonwealth Club in San Francisco on Wednesday. Investors in US Treasuries are an edgy lot these days. Yellen is considered a dove, and when she exudes hawkish overtones, investors listen. So Treasuries took another beating today, a milder one than yesterday’s. And as Treasury prices fell, yields, which move in the opposite direction, rose. The 10-year yield jumped 5 basis points today to 2.47%. It’s up 16 basis points since January 17, when yields bounced off 2.31%. Treasury bondholders had been granted the much needed break from the brutal beatings they’d taken since July last year. 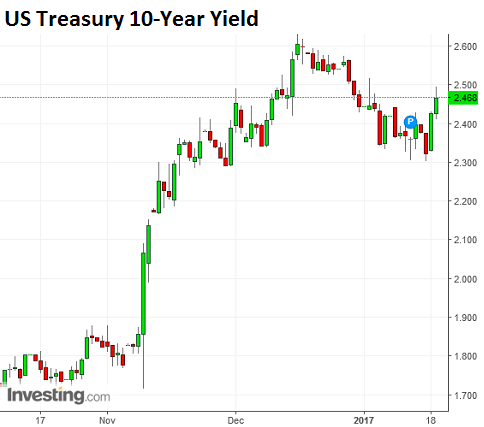 At the time they’d been in Nirvana – those who buy government bonds for capital gains, and not for yield – with bond prices sky-high, and the 10-year yield bottoming out at 1.38%. But after that, it became tough. And after the election, it became a bloodbath, as prices plunged and yields soared to hit 2.61% intraday on December 15. A lot of paper wealth went down the drain. The 3-week rally since then brought yields down 30 basis points, but now the beatings have resumed and will continue until the mood improves. Yet the kinds of radical moves seen after the election are unlikely, unless something extra-fancy happens. And yields could temporary drop as well, particularly if stocks get hit. So what would Yellen do? In December, the Fed raised rates for the second time in this tightening cycle. It took a year of relentless flip-flopping to accomplish that. But now it seems the flip-flopping is over. Yellen told her audience in San Francisco that Fed officials expect to raise the target for the fed funds rate “a few times a year,” including this year, until it’s close to 3% by the end of 2019. So in its view, the Fed isn’t tightening yet. It’s just backing off the accelerator a wee bit. Tightening might then start at above 3%? All this is far in the future and may be beyond reach. In an economy with over-indebted businesses, households, and governments at all levels, short-term “risk-free” rates at 3% or higher, and long-term rates, such as for mortgages, at much higher levels could cause some serious, let’s say, adjustments – of prices. Even if rates don’t quite make it there before all heck breaks loose, the Fed is now seriously on track to take the “foot off the accelerator.” The idea of letting the infamous balance sheet shrink and thus reverse QE is also getting a public hearing from time to time. Inflation may still be below where the Fed would like it to be, but consumers are already feeling the bite. The Consumer Price Index rose 2.1% in December year-over-year and has been on a decided upward trajectory since September 2015. Many consumers, particularly those paying rents and health care expenses, experience inflation rates that are far higher. The Fed’s preferred “trimmed mean PCE” (Personal Consumption Expenditure) inflation gauge rose 1.8% in November from a year earlier. It too has been on an upward trajectory and is headed for the Fed’s 2% target. And average hourly earnings are up 2.9% year-over-year. That’s frazzling the Fed – that wages rise faster than inflation, when it’s all about cheap labor [The Thing in the Jobs Report that Gives the Fed the Willies]. Yellen has taken notice: “Waiting too long to begin moving toward the neutral rate could risk a nasty surprise down the road,” as she warned. So, despite these higher yields, a lot of Treasury buyers would still get hit by inflation without compensation. For example, the five-year Treasury yield is currently 1.96%. While up from 1.23% before the election, it’s below the rate of inflation as measured by CPI. Our hapless 10-year note buyers aren’t out the woods either. If CPI rises to a range between 2.5% and 3%, they’ll see the purchasing power of their principle deteriorate faster than the current yield can fill the hole. Bondholders can hold their bonds to maturity. Thanks to the Fed, the government will never run out of money and will always redeem these bonds. But during that time, they’ll get the puny coupon payments while rising inflation eats into the purchasing power of their principle, which will leave them with a loss after inflation. But if they sell the bond before it matures, depending on when they bought it, and at what price, they get to eat the loss now. It matters because the US bond market, all kinds of bonds combined, is a $47 trillion monster, far larger than the stock market (with a market capitalization of around $27 trillion). And even moderate losses have a big impact. The FED will not be able to raise interest rates more than another .25% due to the massive amount of Debt in the economy, Inflation will run away resulting in Stagflation. Bullish Gold stocks. Market is not buying it, projecting two 25 bps hikes in 2017 compared to the 4 that the Fed is projecting. Hey Richter, are you a sniveling coward? Why do you allow the bigot Frederick’s stupid comment about Yellen? Too bad! Your blog is now exposed for what it is: pandering to hate ideologues who pretend they know the markets. I don’t know how old you are but you are still drinking the Wall Street koolaid. You may think you are smarter than the CNBC drama queens but really your blog is only a statistically written version of Trump’s swamp. Post this if you have any balls! OK, you got my attention concerning what Frederick said about Yellen. True, it was ugly. Every one of those things is a judgement call. I don’t have a five-person committee to vote on it. I make those decisions on the fly. I try to keep the tone civil. At the same time I try to give people some room. I err in both directions. Repeat: I try to keep the tone civil. Did YOU SoberMoney get the message? Or were you drunk? Get lost you miserable troll! You are a gutless wonder who dares not show his real name (and yes I am Jerry). Wolf has great courage in doing what he does, something beyond your pitiful comprehension! Now, who was it that was always talking about drinking KoolAid? Things that make you go hmmmmmm. SoberMoney: Looks like you are the one with no balls hiding behind anonymity. Wolf is here to make sure there are no spams, not to make sure whether we like each others’ comments or not. This is the real democracy not the ones that the likes of you preach. I remember an entity called Excite.com which was on par with Yahoo.com back then when Google was nobody. They censored a lot of stuff, and they went the way of the dodo; censorship turns off users. Besides, if admin of a site filters stuff based on his liking, then where is the democracy in that. And I bet a hapless idiot like you have zero understanding of how many spams Wolf probably has to filter out. I have sites which are not remotely as enticing as WolfStreet to post spam on, but I have to delete hundreds of spams per day regarding the ugliest products you’ve ever seen. I woudn’t be surprised if Wolf doesn’t have to deal with thousands of them. Wait ’til there’s low bid or no bid – that’ll help her decide to raise rates again. Does she really think the Fed ‘controls’ interest rates? I think we’ll see this inverse in our lifetime. And I am not joking. Civilization will be equated with S&P 500 + Dow. Every single CB in the world will be obligated to liquidate their country’s wealth to defend the Maginot. You can’t raise rates in a liquidity trap, which the FED has orchestrated to as degree never before seen in history. Yellen and the FED know this very well, so one must believe the FED and its hundreds of PhD’s in Finance and Economics don’t understand the first thing about their own field of study, or they are doing this deliberately. The 2nd thesis only requires one to believe that they create and destroy on purpose, for their own agenda. Once we grasp this, everything makes sense. I can’t understand after the Fed pussyfooted around rate hikes for YEARS despite constantly signaling that rates were going up that all of a sudden people believe them. Wait until some of these dollar-strapped countries cannot find the funds to retire their dollar debts when they mature. The Fed can monetize (or pretend) but Mexico cannot. Neither can EU countries who borrowed dollars or S. Asian countries who were targets of dollar carry trades. Sadly for them, forex losses due to dollar flight are self-reinforcing which makes defaults on dollar loans inevitable. Besides the liquidity trap, the Fed (pretended) to eliminate risk. PS: Leaving aside the foregoing, as well as the cementing relationship between the dollar and petroleum (‘Hard’ dollar); it is pretty clear the starchy academic Yellen loathes parvenu/professional ignoramus Trump and will sacrifice the economy in order to destroy him. Of course, the Fed is irrelevant (what determines the worth of money is not interest cost of future dollars but rather the free exchange of dollars and other currencies for petroleum millions of times every day at gas stations around the world) … that won’t keep Yellen from doing her best (worst). Tighten your seat belt folks it will be a hell of a ride. Inflation is now running to 3-4%+ (I don’t care what the CPI says) and the tide has turned on this crazy notion of deflation and negative interest rates. From WW2 to 2008 10TY avg around 5%, which is where it should be today, tack on 450bp to this economy and no one gets hurt more than Mr. Real Estate himself Mr. President Trump. He fires the apprentice (at least at holding a real job in this world) Yellen, brings in a crony and the Dollar screams, EM’s tank, dollar debts default, S&P drops (remember P/E is predicated on borrowing costs) and Real Estate drops in half. BLS economic statistics have become increasingly corrupted to serve political purposes. As is they are of no value except as a basis for pragmatic reinterpretation. Not all BLS statistics are amenable to useful correction: GNP methodological changes eventually made the underlying data worthless. As for the Fed, having painted themselves into a corner they are now highly constrained by economic realities. They no longer serve any purpose except as a proxy for TBTF banks; they will never be audited because of the need to avoid political embarrassment. Monetary policy is quite dead, and the legacy of Milton Friedman is properly dismissed as useless. We could be setting up for a worst case scenario: price inflation, and asset deflation. The price of everything going up while the value of your assets decrease. Prices of what you need going up, interest rates going up while stocks and real estate going down sounds about right. I’m wondering.. IF you had some good gains in the stock market and some losses in the bond market.. and you thought we were near a top in the stock market (which I do) why wouldn’t you sell both and use the losses against the gains? Take the money and run! The losses to this point in stocks or bonds are negligible and if this condition were to alter BTFD. Everyone existed the party some time ago and are waiting for that golden ticket day? Speaking of Trump, I can’t help but think that his whole plan is to crash asset prices of EVERYTHING, then make sure that the company run by his kids gets to buy all they want of those assets at rock bottom price. This will require some friendly lending from Wall ST and/or the FRB, but I’m sure that can be arranged if you are Prez. By the way, the above may also be the reason why Trump will not release his tax returns, because they would indorectly show he does not have a fortune (yet). At least Mnuchin agrees that banks gambling in markets should not be allowed to fall back on FDIC to cover their losses. The repeal of Glass-Steagall (A Clinton signature act) allowed the US banking system to become morally hazardous. Clinton also was the intellectual founder of pivoting the Democratic Party from championing the working class to championing identity politics. All in a very successful effort to gain banker funding and making himself personally very wealthy. Leading us to today where the Dems have the least amount of power in state and local governments in history, and the working class hasn’t seen real wage gains in decades. But the Clintons are worth north of a hundred million. Yes, ever since Bill Clinton the democrats have been co-opted by Wall Street, even going so far as to parrot arguments about “free trade.” Wall Street gets rich skimming financial transactions, and workers are outsourced. Smart move, Hillary. People know who’s interests you represent. That’s why you lost. All assets are inflated. It’s obvious. When an external event causes a decent correction, watch the lemming run. “Waiting too long to begin moving toward the neutral rate could risk a nasty surprise down the road – either too much inflation, financial instability or both,”. Yellen is correct. Greenspan and others always waited too long to lower rates and that led to a strangling of the business cycle, as Forbes repeatedly pointed out when I was a subscriber in the 1980’s and 1990’s. After learning the Truth about who ‘owns’ the Fed (ca. 2004), a consortium of International Banksters and not the US Government or We The People, it became more clear of what the machinations of the Fed were really all about; that of making Trillion$ for those International Bankster owners, while keeping the US business cycle for disintegrating completely as they siphoned off the cream of US productivity gains. Lately, the Fed had to keep the US system from a total collapse, 2008 to be specific, after organized crime infiltrated Wall Street in the mid 1990’s and early 2000’s, and shuffled 3 to 5 Trillion$ of ‘fake paper’ into the mortgage markets and sold that to unsuspecting investors worldwide. The Fed had to unexpectedly ‘cover that crime’ to maintain ‘face’ on the international scene and to keep ‘the system’ from collapsing. It’s almost like a rogue element of the international banksters’ clique pulled a con job on their buddies, knowing their buddies would have to cover their crime in order to keep ‘this setup of ours’ from collapsing. Now, the Fed bankster buddies are in process of ‘getting their money back’ from covering their rogue elements’ losses to ‘their’ system, and are doing that by slowly raising interest rates, causing the US Govt. to have higher borrowing costs on that soon to be $20 Trillion$ public debt. However, as Rumsfeld said ‘It’s a new world now, and “deficits don’t matter”.’ Meaning that we can borrow with impunity and the US$ won’t implode from devaluation due to internationally perceived currency dilution from overprinting (like happened in Weimar Germany in 1921). And in this respect ‘it’s working’, we have borrowed like crazy, built the world’s biggest military and corporate structures, and have ‘spent our way to prosperity’. So why would we want to get rid of the Fed and risk a hyperinflation of our currency in international perception, so as to get rid of the interest payments on our national debt ? As ‘value’ resides in the ‘mind of the buyer’, maintaining the perception of value in the mind of the international buyers is paramount. When confidence falters disaster follows. We’re working on the problem ! Looking at who Trump has appointed and how many conflicts of interest Trump has.. I just can’t imagine that he can fix what’s wrong because it would cost him, his children and most of his appointees to many $billions. The fine line he is going to have to walk to keep interest rates from climbing rather rapidly and to keep the controversy away from his conflicts of interest would be an amazing feat! From listening and watching him and quite a few confirmation hearings of his appointees, I don’t believe he can. He is to thin skinned and to fast to react to everything, even before he has any back ground information and most of the time before he even thinks.. This is going to be the most interesting time in my life and the country has gone thru a lot since I was born. I just don’t see how this country can avoid a steep deflationary cycle with all the debt being carried. There just isn’t a lot of room for adjustments. It would take a strong steady hand of a fiscal conservative to manage it and I believe Trump is an ultimate gambler who plays hard and sometimes loses big. We can’t afford to lose big and I just can’t add up any scenario where we can win big carrying the load we are carrying. Since when does the President of the United States control interest rates? Policies control interest rates and if the governments policies are to borrow lots of money or restrict trade they can and do affect interest rates actually more than the FED. The government can affect the risk element in interest rates rather dramatically. Yeah I guess that is why policies under the previous administration and $10 trillion in more debt caused interest rates to soar………………..not.